THE Davao City Environmental Care Inc. (DCECI) claimed that scavengers, not they, were responsible for the hazardous and infectious wastes that were dumped near the Butuanon River last week. In his explanation letter addressed to Mandaue City Mayor Luigi Quisumbing, DCECI director for operations Dominador Bullicer denied allegations that his firm unloaded the hospital waste outside their plant near the Butuanon River. As their investigation on DCECI is still continuing, the Environmental Management Bureau (EMB) 7 is verifying information that another batch of hazardous and infectious waste was found in Sibonga, southern Cebu. Bullicer said the wastes found there belonged to a group of scavengers who clean and dry recyclables and reusables they gather. “This is their livelihood that we don’t intend to disturb, on what they do. Neither do we have the authority to prevent or stop them,” Bullicer said. Bullicer said the Mandaue City Environment and Natural Resources Office (MCENRO) immediately condemned his firm for the act and didn’t even give them the chance to explain their side. “Your CENRO has already condemned us even before we could answer and explain the notices of violation. Due process demands that we should be given first the opportunity to answer the accusations before your CENRO would threaten to sue us. 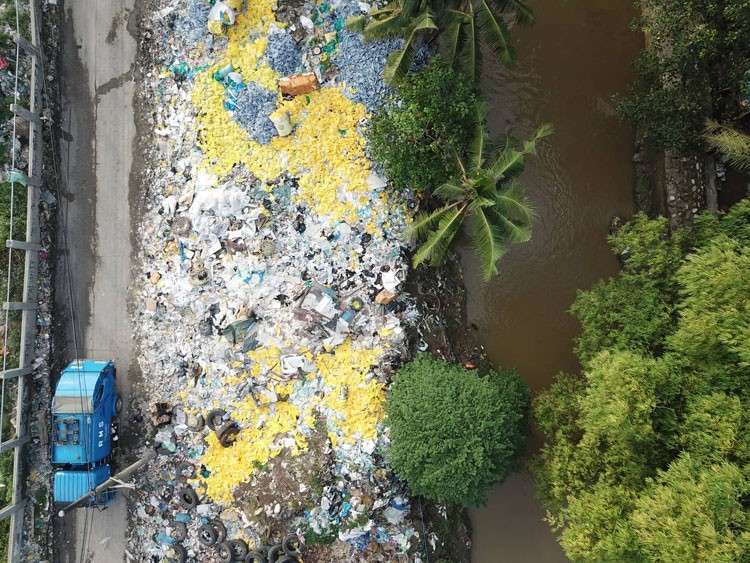 Also, the EMB 7 is still conducting the investigation on the hospital waste found floating off the shores of Barangay Ibo, Lapu-Lapu City, and they are yet to establish who is or are responsible,” Bullicer said in his explanation letter. But Bullicer said they will assist the Mandaue City Government in requesting the scavengers to clean up or for them to store or keep their recyclables and reusables that they dry up at the vacant lot outside their plant. Earlier this week, the Mandaue City Government issued a cease and desist order (CDO) against DCECI over the bags of hazardous waste found in Sitio Tambis, Barangay Umapad. Aside from the CDO, the MCENRO recommended to the City Legal Office the filing of charges against DCECI for various environmental violations. The Mandaue City-based firm is also facing legal challenges, including a recommendation from the Department of Environment and Natural Resources (DENR) 7 and EMB 7 to suspend its Treatment, Storage and Disposal (TSD) registration after medical waste that it was supposed to collect and treat ended up in the Mactan Channel and other areas. In a press conference Wednesday, Jan. 16, DENR 7 Executive Director Gilbert Gonzales told reporters that they had sent a team to Sibonga to investigate allegations that medical waste was found there. Gonzales also confirmed that the results of their investigation on the hospitals and treatment facilities involved in the alleged disposal of medical waste at the Mactan Channel will be released this week. After recommending the suspension of DCECI’s Treatment, Storage and Disposal (TSD) Registration earlier this week, the EMB 7 introduced another accredited service provider that could assist hospitals that were affected by the firm’s suspension. Starting Tuesday, Jan. 15, the Aquilini Mactan Renewable Energy Inc. based at the Cebu Light Industrial Park in Barangay Basak, Lapu-Lapu City started collecting medical and hazardous waste. William Cuñado, EMB 7 director, said AMREI can collect and process around 75 tons of medical and hazardous waste on a daily basis. Only 15 tons of medical wastes are collected from public and private hospitals in Metro Cebu daily. Cuñado said that before they are treated, medical waste is often stored in a facilty or Material Recovery Facility (MRF) owned by the hospital. The waste is then processed through an autoclave, a type of pressure chamber that uses pressurized steam to decontaminate infectious waste. After autoclaving, the waste is placed in a yellow bag before it is collected. Tracking the whereabouts of their infectious waste is an obligation of hospitals as mandated by Republic Act 6969 or the Toxic Substances and Hazardous and Nuclear Waste Control Act of 1990. Lawyer Unalee Monares, EMB 7 legal division chief, said they have not yet penalized DCECI despite the violations as it was given 15 days to provide a position paper. Based on the Health Care Waste Management Manual released by the Department of Health (DOH), handling waste from hospitals, mortuaries, clinics and laboratories involves four main elements: identification of the waste, collection, sterilization and final disposal or recycling. The manual provides six health care waste treatment technologies to treat hospital and other infectious waste. These are thermal or using high heat to destroy pathogens; chemical disinfection, irradiation which involves using machines generating high energy to sterilize waste; biological processes, encapsulation for the disposal of sharps and chemical or pharmaceutical residues; and inertization, which is suitable for pharmaceutical waste. In disposing of hospital waste, the DOH provides three ways, such as disposing of them in a sanitary landfill, safe burial on hospital premises or burying them in a septic or concrete vault. Meanwhile, persons can’t be infected with Human Immunodeficiency Virus (HIV) by eating fish caught at the Mactan Channel, a health official said on Wednesday. The Department of Health 7 said it can sue netizens who spread false information on HIV. Dr. Van Phillip Baton, DOH 7 HIV-AIDS program director, said HIV cannot be contracted through food. Baton made the reaction after reading various posts circulating in social media that eating fish caught in the Mactan Channel can cause HIV infection. The Lapu-Lapu City Government earlier advised the public to avoid swimming at the Mactan Channel temporarily after tons of medical wastes were found dumped on the waters off some barangays since earlier this month. “Definitely, you can’t get HIV through food. HIV’s first letter is human. Only human beings can carry and transmit the virus,” Baton said. He also said that HIV cannot be transmitted by swimming in seawater contaminated by dumped medical waste. “Can swimming in sea water transmit the virus? No, because the virus cannot survive for long outside the human body,” Baton said. The Bureau of Fisheries and Aquatic Resources (BFAR) 7, on the other hand, said fish caught at the Mactan Channel are still safe to eat despite reports of contamination from medical waste. Alma Saavedra, BFAR 7 information officer, said the possibility of fish being contaminated from blood and other medical waste dumped at the Mactan Channel is farfetched as fish don’t eat plastic or rubber. She said that fish don’t approach coastal areas where solid wastes abound. Baton warned that those spreading false information about contracting HIV by eating fish caught at the Mactan Channel could be sued for violating Republic Act 11166 or the Philippine HIV and Aids Policy Act.